Well this little lady is from the TAC So Sweet set and I colored her with Copics, added a jewel to her and then colored in around her to make the scene. 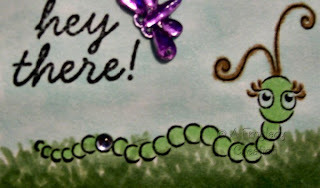 I stamped the hey there (TAC also) and it seemed to be floating in mid air so I added the dragonfly doodad on top. Since I had colored this image previously and added the purple dragonfly already I had to find papers to go with it. 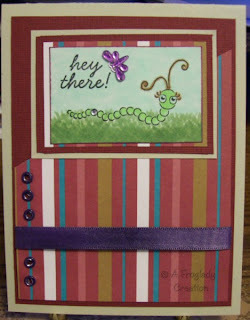 While digging in my scrap bin I found this awesome striped paper and it livened the whole thing up! I used purple ribbon which I colored with my Copic marker to match the brads I wanted to use along the side. Layered with mauve and green papers and ended up with the card above. What do you think? Can't wait to see what you all do with this week sketch...head over to C4E and check out the rest of the DT team did and then give it a try yourself! Love your card, thats a real fun image, also like the words. I have this set and it is one of my favorites. Love what you've done with it.